With the growing need for sustainable agricultural practices, sustainable management of insect pests has become a priority area of interest to me. My focus is to understand cue-mediated interactions between the insect pests’ communities and their environments and to transfer the skills in creating environmentally sound management approaches. At the moment, I focus on comprehending how chemical signatures shape the interaction within D. suzukii population, and between the species and other drosophilids. 2014 BSc. 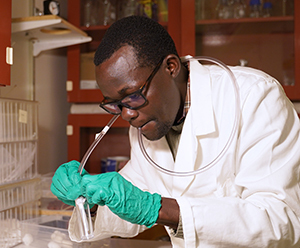 Biology, University of Nairobi. 2017 MSc Agricultural Entomology, University of Nairobi. Expertise: Entomology, behavioral ecology, chemical ecology, and related techniques. Kwadha CA, Mutunga JM, Irungun J, Ongamo GO, Ndegwa P, Raina S, Fombong AT (2019) Decanal as a major component of larval aggregation pheromone of the greater wax moth, Galleria mellonella. Journal of Applied Entomology (accepted for publication).